Once you have decided to remodel your house, the question becomes what is the best way to go about it, and if you are like most people, you will be working from a budget. Saving money will be a top priority for you. The following are two tips on how to save money on your home remodeling project. In other words, you don’t want to move the location of your kitchen sink or the location of the toilet in your bathroom. Although it is possible to do this, it adds a lot of money to a remodeling project. It is better to think about your new kitchen or bathroom with the same location of your existing plumbing fixtures. 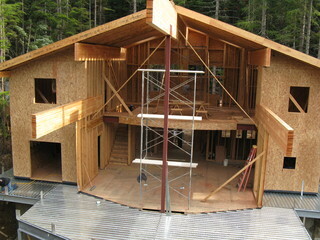 Make sure that the remodeling design you choose does not require additional support beams. Of ten a homeowner will want to expand a room, but it will require an additional support post for the ceiling. This type of work can become very expensive, but it is easily avoidable by designing with the exiting foundational support in your home. Along with the two tips above, you can discuss your design ideas with a local contractor before deciding on what you want. A contractor can let you know how to avoid all of the most expensive aspects of remodeling. Once you have answered the basic question of how to remodel my house, you can get in touch with a contractor to get further information and get a quote.